Set your '09-Current Dodge Ram Truck apart from the rest with this aggressive looking Body Side Graphic kit. This easy-to-install two (2) piece kit is packaged as PRECUT pieces which are ready to install in a wide variety of colors - NO TRIMMING required (slight trimming required for truck boxes equipped with RamBox Cargo Management System)! Select from one (1) of two (2) unique designs. 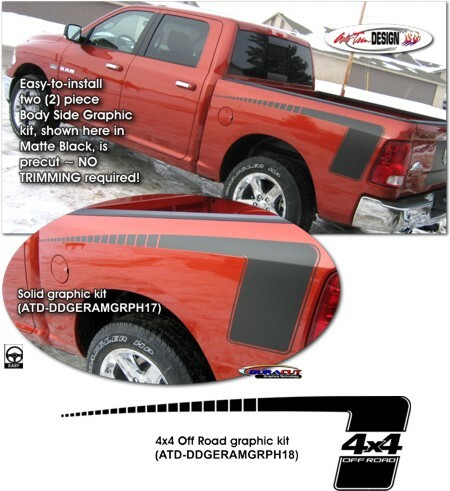 While kit is specifically made for and shown on an '09-Current Dodge Ram Truck with a 5'7" or 6'4" rear box, graphic may fit other year vehicles as well. Please measure your truck prior to ordering. Graphic is designed to follow the distinct factory contour of the box as shown. Please Note: Graphic kit is designed to fit 5'7" and 6'4" boxes of '09-Current Dodge Ram Quad and Crew cab trucks. We do not guarantee fitment with 8'0" box body lines.